Neoplastic tumor of the cheek skin, here a benign neoplasm of the sweat glands called Hidradenoma, which is not solid but is fluid-filled. Tumor (or "tumour") is the term for an abnormal growth of cells (neoplasm) that has formed a lump, whether benign (noncancerous), malignant (cancerous), pre-malignant, or without any cancerous potential whatsoever. In other words, a tumor is a neoplasm where the abnormal growth of body tissue has resulted in a visual mass that appears enlarged in size. There are many types of both benign and malignant tumors. The prognosis for benign tumors is good, with many not requiring any treatment. However, malignant tumors are a leading cause of death worldwide. While the process of DNA replication has many control and correction features, and a healthy immune system can generally recognize neoplastic cells and destroy them before they proliferate, tumors are not uncommon. Some have a hereditary basis and local trauma or injury can also be a causal factor. However, many also are related to environmental and lifestyle factors, such as exposure to such environmental toxins or agents as tobacco smoke, pollution, UV radiation, chemicals, and viruses. The terms tumor, neoplasm, and cancer are not synonymous, but do intersect. Neoplasm is a medical term that refers to an abnormal proliferation of cells in contrast with healthy new cell growth and normal tissue. The growth of the cells exceeds and is uncoordinated with that of the normal tissues around it, resulting in an abnormal growth of tissue. Tumor is the term for an abnormal lump of tissue formed by a neoplasm. However, while neoplasms often cause a lump or tumor, a neoplasm does not always proceed to such a visual mass. For example, leukemia is a type of neoplasm that is characterized by an abnormal increase of immature white blood cells but does not form a lump. Cancer is the term for a "malignant neoplasm." Cancer is characterized not only by the uncontrolled growth of cells (division beyond the normal limits), but also the ability of these abnormally dividing cells to spread from the original site, whether to adjacent tissues (invasion) or, in some cases, even to distant sites in the body (metastasis). While the terms tumor, neoplasm, and cancer are often used interchangeably (all three involve a failure of cell division control), they are distinct. For one, cancers and neoplasms may not form a tumor (eg. leukemia). Secondly, cancers are malignant (tendency to become progressively worse) and characterized by the ability to spread from the original site (invasions and metastatis). Tumors and neoplasms may be malignant and capable of spreading (cancerous), but they also may be benign and not capable of invading into adjacent tissues or spreading to distant tissues. Tumors and neoplasms also may be pre-malignant (morphologically altered tissue in which cancer is more likely to occur). In other words, a benign tumor or benign neoplasm does not spread or migrate to surrounding tissues; thus, it is not considered cancer; the malignant versions do involve the invasion of surrounding tissues and perhaps the spreading to other parts of the body; thus, a malignant tumor or malignant neoplasm is cancer. Furthermore, the removal of a benign tumor usually prevents the re-occurrence of the condition, whereas if the cancer has spread to surrounding tissues, the removal of a malignant tumor does not prevent the re-occurrence of the cancer (Carson-Dewitt 2002). It is not uncommon for the term tumor is be used currently and historically for other conditions of swelling other than an overgrowth of neoplastic cells. 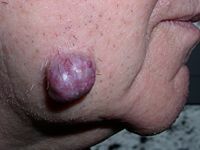 For example, cysts (such as sebaceous cysts) are also referred to as tumors, even though they have no neoplastic cells. This is standard in medical billing terminology (especially when billing for a growth whose pathology has yet to be determined). Related terms are common in the medical literature, where the nouns tumefaction and tumescence (derived from the adjective tumefied), are current medical terms for non-neoplastic swelling. This type of swelling is most often caused by inflammation caused by trauma, infection, and other factors. The term tumour/tumor is derived from the Latin word for "swelling"—tumor. It is similar to the Old French tumour (contemporary French: tumeur). In the Commonwealth countries, the spelling "tumour" commonly is used, while in the United States, the term is usually spelled "tumor." In its medical sense, tumor has traditionally meant an abnormal swelling of the flesh. The Roman medical encyclopedist Celsus (ca 30 B.C.E. - 38 C.E.) described the four cardinal signs of acute inflammation as tumor, dolor, calor, and rubor (swelling, pain, increased heat, and redness). His treatise, De Medicina, was the first medical book printed in 1478 following the invention of the movable-type printing press. Adenomas: Benign tumors that arise in the epithelial tissue of a gland/gland-like structure, such as a polyp in a colon. Sometimes these can become malignant. Fibromas/Fibroids: Occur in onnective or fibrous tissue, such as in the uterus, which can lead to vaginal bleeding, bladder difficulties, etc. Hemangiomas: Buildup of blood vessel cells in organs or skin, such as a common type of birthmark. Lipomas: Slow growing, round and movable tumors that grow from fat cells, and commonly found in adults in arms, back, shoulders, and neck. Meningiomas: Often benign, sometimes malignant tumors that occur in the membrane surrounding the brain and spinal cord. Myomas: Grown from muscle, including leiomyomas (from smooth tissue, such as in the stomach and uterus, and which may start in the walls of blood vessels), leiomyomas (in the uterine wall, often called fibroids), and rhadbomyoma (skeletal muscle). Nevi: moles, or growths on the skin, although some types may develop into skin cancer. Papillomas: from epithelial tissue and form in the shape of finger-like fronds, which may be benign or malignant. Benign tumors, like lipomas, tend to be well circumscribed and commonly are easy to remove completely. A lipoma is the most common form of soft tissue tumor and is composed of adipose tissue. They are usually movable and painless and generally do not need to be removed, unless their location restricts movement or causes pain, or there is a desire to remove them for cosmetic reasons, or a desire to make sure they are not a malignant tumor. They can be removed by simple excisions under local anesthetic or liposuction. Malignant tumors pose some of the most difficult conditions to remove surgically or treat. About 40% are treated solely by surgery, which is generally combined with other treatments, such as radiation therapy or chemotherapy. Because cancerous tumors spread to normal, sometimes distant tissue, the effectiveness of surgery to cure the condition is related to how well the tumor is localized. Generally, if well localized, there is an effort to remove it as soon as possible. Even surgery that cannot cure the condition is often considered to make other treatments more effective by making the condition smaller. Curative surgery does carry the risk of spreading or seeding the cancer during removal, such as spilling cells into other tissue or knocking them loose into the bloodstream (Polsdorfer 2002). Among the biopsy techniques for tumors are "aspiration" (insertion of a needle to withdraw a sample), "needle" (use of a cutting needle to cut out a core sample for analysis), "incisional" (removal of a portion of a large tumor for analysis), and "excisional" (removal of a whole lesion along with surrounding normal tissue) (Polsdorfer 2002). It can be dangerous to biopsy a number of types of tumors in which the leakage of their contents would potentially be catastrophic. When such types of tumors are encountered, diagnostic modalities such as ultrasound, CT scans, MRI, angiograms, and nuclear medicine scans are employed prior to (or during) biopsy and/or special exploration/excision in an attempt to avoid such severe complications. Tumor markers help physicians identify cancers for certain types of tumors. Tumor markers are substances (proteins, enzymes, etc.) that are produced by tumor cells or the body in response to tumor cells, with these substances increasing in the blood stream as tumor cells multiply and cancer spreads. For example, the beta-subunit of the HCG hormone is a tumor marker for testicular cancer and Cancer antigen 19-9 (CA 19-9) helps in the diagnosis of pancreatic cancer for individuals with a certain blood type. Not all individuals may exhibit increased levels of the tumor markers (Nordenson 2002). Since a benign tumor is not malignant, and does not invade or spread to other tissues, the outlook for the patient is good and often do not require any treatment. However, some may require treatment because of pressure on such structures as blood vessels, nerves, or general body movement or removal may be sought for other reasons, such as cosmetic. Treatment options include surgery, medication, and radiation. Malignant tumors, on the other hand, represent a serious risk, with cancer among the leading causes of death worldwide. Carson-DeWitt, R. 2002. Cancer. Pages 631-638 in J. L. Longe, The Gale Encyclopedia of Medicine, 2nd edition, volume 2. Detroit, MI: Thomson Gale. ISBN 0787654914. Chang, L. 2010. Benign tumors. WebMD. Retrieved March 3, 2012. Kleinsmith, L. J. 2006. Principles of Cancer Biology. Pearson Benjamin Cummings. ISBN 0805340033. Nordenson, N. J. 2002. Tumor markers. pages 3412-3415 in J. L. Longe, The Gale Encyclopedia of Medicine, 2nd edition, volume 5. Detroit, MI: Thomson Gale. ISBN 0787654949. Polsdorfer, J. R. 2002. Tumor removal. Pages 3415-3416 in J. L. Longe, The Gale Encyclopedia of Medicine, 2nd edition, volume 5. Detroit, MI: Thomson Gale. ISBN 0787654949. Tannock, I. F., R. P. Hill, et al. (Eds.). 2005. The Basic Science of Oncology 4th ed. McGraw-Hill. ISBN 0071387749.